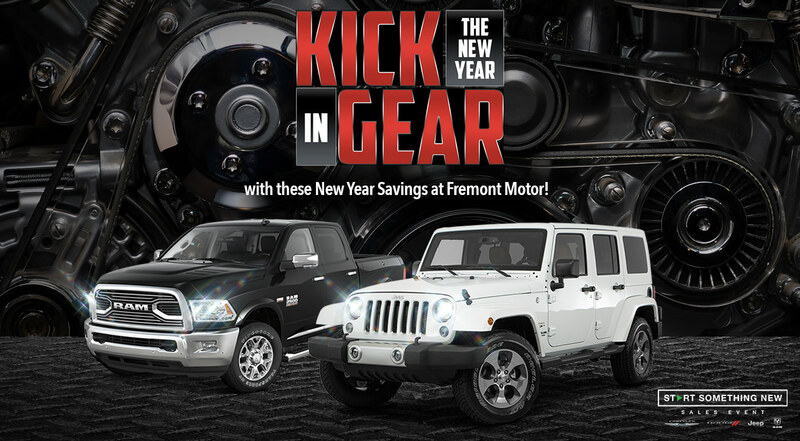 Check out these deals today at Fremont Motor Chrysler, Dodge, Jeep, and RAM, in Casper, Cody, Lander, Powell, and Rock Springs! STK #1J17108. MSRP $23,915. Prices include all applicable dealer incentives and manufacturer rebates and are based off MSRP, not all buyers will qualify. Current offers are not available on prior purchases or pre-negotiated deals. Prices plus tax, tag, title and dealer fee. See dealer for details. Offers expire 01/31/2018. STK #11J17338. MSRP $39,945. Prices include all applicable dealer incentives and manufacturer rebates and are based off MSRP, not all buyers will qualify. Current offers are not available on prior purchases or pre-negotiated deals. Prices plus tax, tag, title and dealer fee. See dealer for details. Offers expire 01/31/2018. STK #6D17269. MSRP $48,875. Prices include all applicable dealer incentives and manufacturer rebates and are based off MSRP, not all buyers will qualify. Current offers are not available on prior purchases or pre-negotiated deals. Prices plus tax, tag, title and dealer fee. See dealer for details. Offers expire 01/31/2018. STK #1D17265. MSRP $62,140. Prices include all applicable dealer incentives and manufacturer rebates and are based off MSRP, not all buyers will qualify. Current offers are not available on prior purchases or pre-negotiated deals. Prices plus tax, tag, title and dealer fee. See dealer for details. Offers expire 01/31/2018.